Are you tired of having to ask ten taxis and after a long time finally one decides to take you home? Or when you get a taxi, they don't want to use the meter? There are many taxis in Bangkok, but they're too picky! We have an another option for you to consider, UBER the personal driver for everyone. UBER is a transportation company that is headquartered in San Francisco, California. The co-founders started the company in 2009, and they officially launched UBER's services and mobile app a year after. UBER took major cities across the US in a storm such as New York, Boston, Seattle, Chicago, and Washington D.C. Since then UBER's growth exploded and in the last five years the company has extended its service to over 68 countries around the globe. Grabbing a ride with UBER will make you feel like you have your very own chauffeur. UBER only employs contracted drivers and each employee runs trough a detailed criminal background check to guarantee the utmost safety of their guests. UBER states that their service is safe, comfortable, does not turn down the rider, and you don’t need to pay in cash. If you never used UBER service, you will need to download their application on your smartphone. It is currently available on iOS, Android and Windows Phone. Once you open the application, you can create a new user if you’re using UBER for the first time or sign in if you already have an UBER account. Please note that you will need either a credit card or a PayPal account as UBER doesn't accept cash payments. 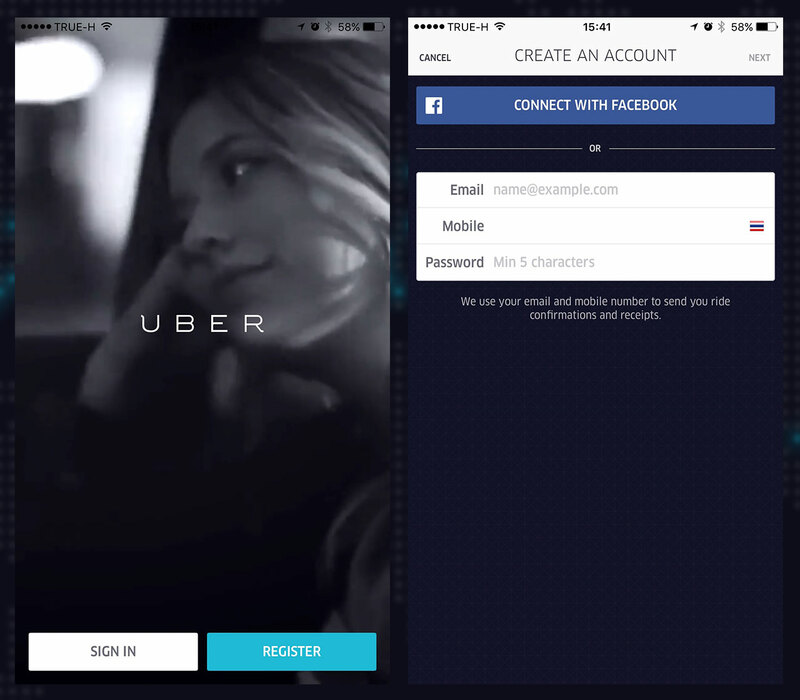 UBER offers two kinds of transportation options to choose from, uberX and UberBLACK. UberX is the cheaper option, featuring small to mid-class cars like Vios and Corolla's. UberBLACK, on the other hand, will indulge you with a luxury car fleet including Fortuner's, Camry's, Accord's and if you're lucky a Mercedes Benz. Please have a look at the fares below to compare the two available options. The app provides you detailed information about your account by tapping on the hamburger icon in the top left of the screen. Once you’re ready to get a ride, tap the “SET PICKUP LOCATION”. Next, you can pin the marker on the map or conveniently search a location by pressing the right arrow button to let your driver know where you would like to be picked-up from. By tapping “FARE ESTIMATE” UBER will provide you with a fare estimation of your journey. To request a car, tap “REQUEST uberX” (or UberBLACK). Once the driver accepted your request, the app will show you the driver’s photo, name, car registration number and type of car. You can also tap the contact button to send the driver a message or call them. During your trip, you will see the progress and your current location in real-time and the estimated arrival time. This information can also be shared with a relative or a friend by tapping "Share My ETA". One important part of UBER is to rate your trip and driver once you arrived safely at your destination. This helps UBER to quickly sort out any black sheep and keep their service quality on a high level. 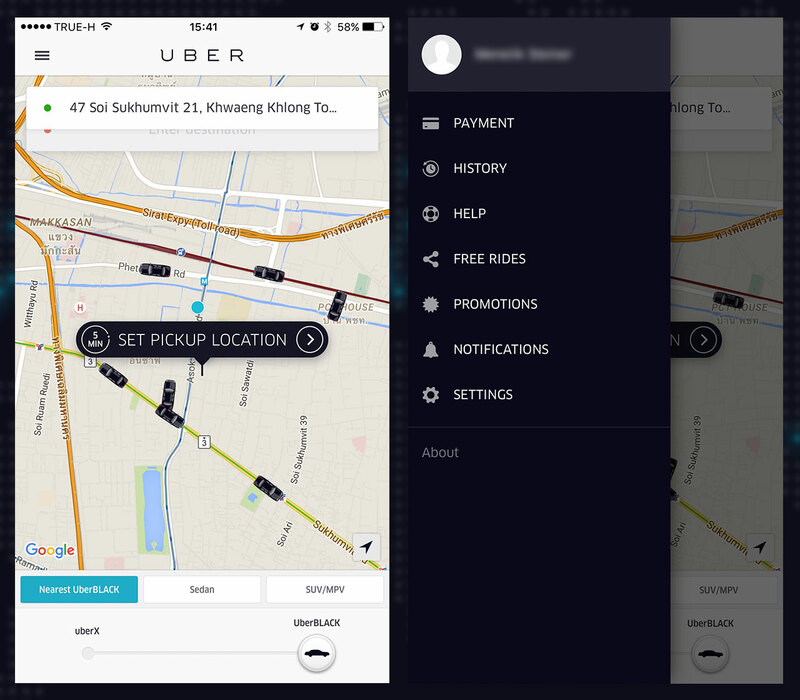 UBER Bangkok offers two pricing classes. 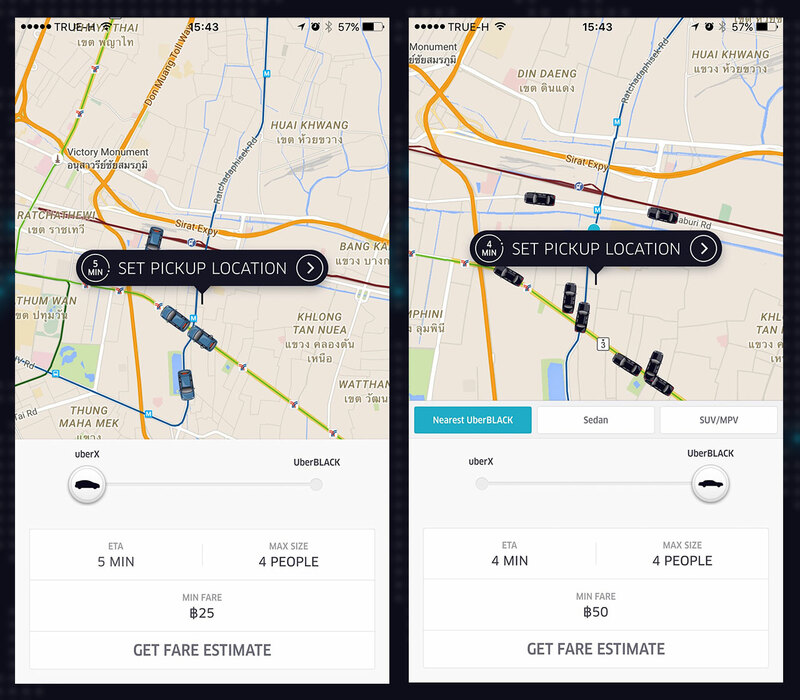 uberX starts from 25 Baht with 1 Baht per minute and 4.50 Baht per kilometer. 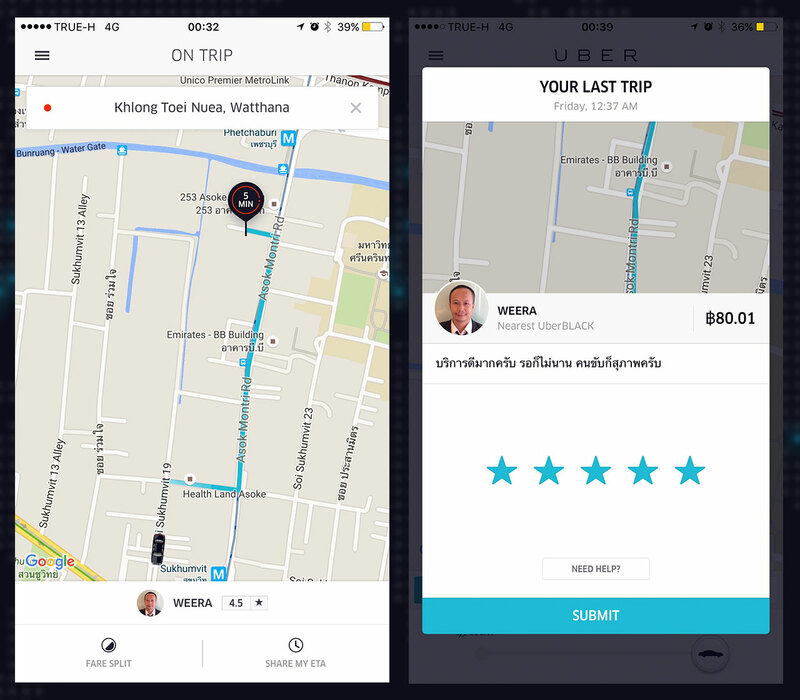 UberBLACK starts at 50 Baht with 2.50 Baht per minute and 14 Baht per kilometer. 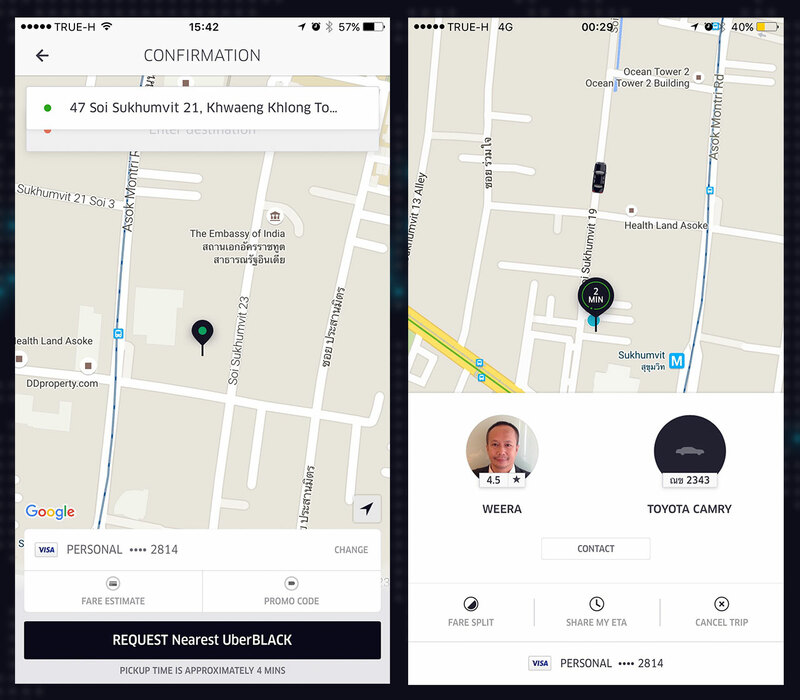 The cancelation fee for uberX is 45 baht and 75 baht for UberBLACK. Each car can take a maximum of 4 people. You also have the option to split your fare with a friends as long as they also have a registered UBER account. The price of UBER may be higher compared to normal taxis, but the comfort and safety you get by using UBER are worth the surcharge in our opinion. The service is particularly appealing for women who travel alone as each driver is real-time monitored by UBER, minimizing the chances for an assault. Don't forget to share this article with your friends and if you have any suggestions, we're looking forward to hearing from you via the comment box below.